We offer a full range of property management services tailored to you as an investor, homeowner, or landlord. We manage a portfolio of single family homes, townhouses and condos and mixed use residential/commercial units throughout the Bay Area. The San Francisco Bay Area, commonly referred to as the Bay Area, is a populated region that surrounds the San Francisco and San Pablo estuaries in Northern California. The region encompasses the major cities and metropolitan areas of San Francisco, Oakland, and San Jose, along with smaller urban and rural areas. The Bay Area's nine counties are Alameda, Contra Costa, Marin, Napa, San Francisco, San Mateo, Santa Clara, Solano, and Sonoma. Home to approximately 7.44 million people, the nine-county Bay Area contains many cities, towns, airports, and associated regional, state, and national parks, connected by a network of roads, highways, railroads, bridges, tunnels and commuter rail. The combined statistical area of the region is the second-largest in California (after the Greater Los Angeles area), the fifth-largest in the United States, and the 43rd-largest urban area in the world. The San Francisco Bay Area has the 2nd most Fortune 500 Companies in the United States, and is known for its natural beauty, liberal politics, entrepreneurship, and diversity. The area ranks second in highest density of College graduates, and performs above the state median household income in the 2010 census; it includes the five highest California counties by per capita income and two of the top 25 wealthiest counties in the United States. Based on a 2013 population report from the California Department of Finance, the Bay Area is the only region in California where the rate of people migrating in from other areas in the United States is greater than the rate of those leaving the region, led by Alameda and Contra Costa counties. 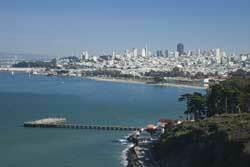 The Bay Area is divided into 5 major areas, known as the East Bay, North Bay, Peninsula, San Francisco and the South Bay. Berkeley Emeryville Oakland Alameda Bay BridgeThe eastern side of the bay, consisting of Alameda and Contra Costa counties, is known locally as the East Bay. The East Bay can be loosely divided into two regions, the inner East Bay, which adjoins the Bay shoreline, and the outer East Bay, consisting of inland valleys separated from the inner East Bay by hills and mountains. The area south of San Francisco to the Silicon Valley, geographically part of the San Francisco Peninsula, is known locally as The Peninsula. This area consists of cities and suburban communities in San Mateo County, and the northwestern part of Santa Clara County, as well as various towns along the Pacific coast, such as Pacifica and Half Moon Bay. This area is extremely diverse. San Francisco is surrounded by water on three sides; the north, east, and west. The city squeezes approximately 805,000 people in under 46.9 square miles (121 km2), making it the second-most densely populated major city in North America after New York City. On any given day, there can be as many as 1 million people in the city because of the commuting population and tourism. San Francisco also has the largest commuter population of the Bay Area cities. The limitations of land area, however, make continued population growth challenging, and also has resulted in increased real estate prices. The communities at the southern region of the San Francisco Bay Area are primarily located in what is known as Silicon Valley, or the Santa Clara Valley. These include the city of San Jose, and surrounding municipalities, including the high-tech hubs of Santa Clara, Milpitas, Cupertino, Sunnyvale as well as many other cities like Saratoga, Campbell, Los Gatos and the exurbs of Morgan Hill and Gilroy.